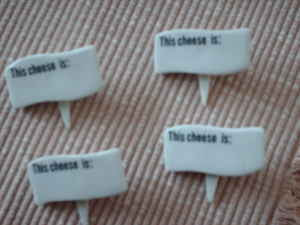 I saw your ad on Craigslist for the This Cheese Is ...... http://toronto.en.craigslist.ca/tor/hsh/1456836689.html For 25 cents each I think this is a great deal, but I was just wondering if you could tell me in advance what the cheese is? I think I would be willing to pay a little more (maybe 30 cents each) if you would. Seeing as I would have to come and pick them up. STOP EMAILING HERE. YOU'RE NOT FUNNY! I HAVE ADDED YOUR EMAIL ADDRESS TO MY JUNK LIST. NEXT EMAIL I WILL REPORT YOU TO CRAIGSLIST! I WILL NOT ANSWER OR READ ANYMORE EMAILS FROM YOU! Secondly) How will you report me to Craig's List if you will not even be reading my emails? It is a shame you will not read this. This cheese is....... easily enraged apparently. PS: Please send me your address so I can come pick up the items.